The Fetid Swamp Mouse is a breed of mouse found in the Jungle of Dread. They are known to drop Fire Salt, Hinge of Eternity and Runic Potion. Cheese: Crunchy Havarti cheese Charm: ?? The Fetid Swamp mouse gives off a foul odour which wilts nearby plant life. Its forced existence within swamps, among these wilted plants, has given this mouse an interesting penchant for Crunchy Havarti cheese. Fetid Swamp mice have been found to be especially attracted to Crunchy Havarti cheese, to the point that any other kind of cheese will simply not suffice. Shadow type traps such as the Clockapult of Time are very effective against Fetid Swamp mice. All traps with other power types, including Arcane type traps such as the Obelisk of Slumber, are ineffective against these mice. The Fetid Swamp Mouse drops the Jungle of Dread Egg during the annual Spring Egg Hunt. On 13 December 2009, Fetid Swamp Mice dropped the Laboratory Map Piece for the first time. 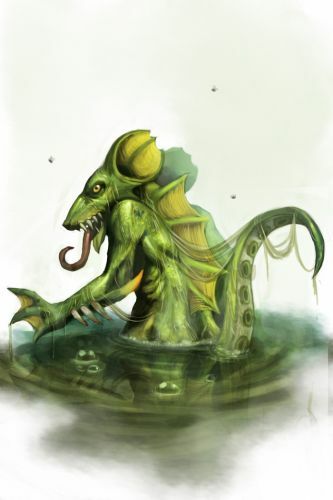 During the Spring Egg Hunt 2011, Fetid Swamp mice began dropping a bonus Jungle of Dread Egg as loot for hunters who had obtained the Rocket Rabbit Mallet. They dropped the same loot the following year during the Spring Egg Hunt 2012 event for hunters who had obtained the Eggscavator. 29 July 2015: The Fetid Swamp Mouse stopped dropping Laboratory Map Piece. This page was last edited on 13 February 2016, at 08:32.